That’s the thing about greeting cards. We always want to know who sent us a card and what does it look like? That’s why my all-time, overall, favorite marketing tool is a custom-designed, personalized greeting card. Are you using these to promote your business, say thanks to someone, or communicate with your customers and prospects? 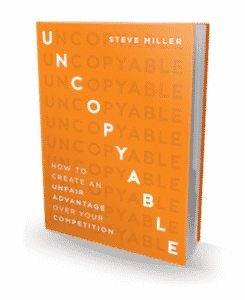 You should, and that’s the topic of this week’s Uncopyable Business episode. I’ll explain why they’re such a powerful too and share how we produce them. Watch this week’s Uncopyable Business! Thanks Steve, I do a mixture of greeting cards, note cards, email cards and postcards. I believe the personal touch is still there also! Excellent tip Steve, thank you! And yes I sure would like to see a video on how you design your cards! I agree completely with this. Going to check out this service right now. I’ve been doing it myself.I would love to see an episode on how you design your cards.